Inflatable boat rental companies in Sanya have been ordered to shut down their businesses for tourists’ safety according to the Sanya Maritime Bureau. More than 20 inflatable boat cases have been handled since Sanya Sea Rescue Sub-center established a year ago. 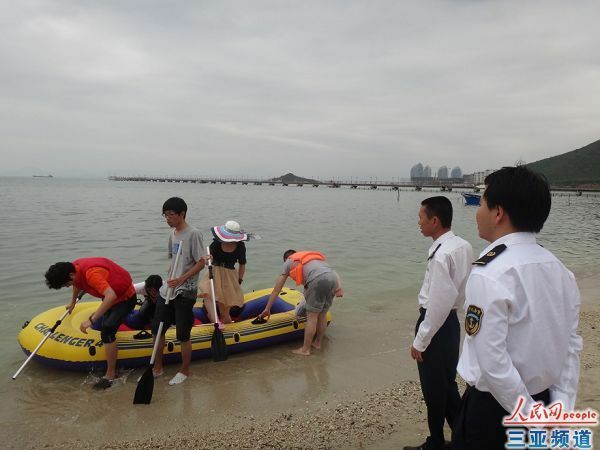 In a recent case, 3 tourists were rescued off the waters near Jinjiling Road by at night on 17th Feb.
Inflatable boats put several tourists in danger on the waters of Sanya Bay and Luhuitou Bay recently. Tourists who go on a raft trip by private or rental inflatable boats are easy to run into danger due to lacking safety awareness and knowing little about the waters or weather. To prevent this kind of accident from happening again, the Sanya Maritime Bureau decided to ban inflatable boat rental and at the same time strengthened beach patrol. Tourists who go on a raft trip with an inflatable boat should enhance safety awareness, as the changeable weather, dangerous waters and lifesaving equipment shortage can make surviving impossible when their inflatable boats run into trouble on cruises.